The word, bull comes from the Latin, bubble. 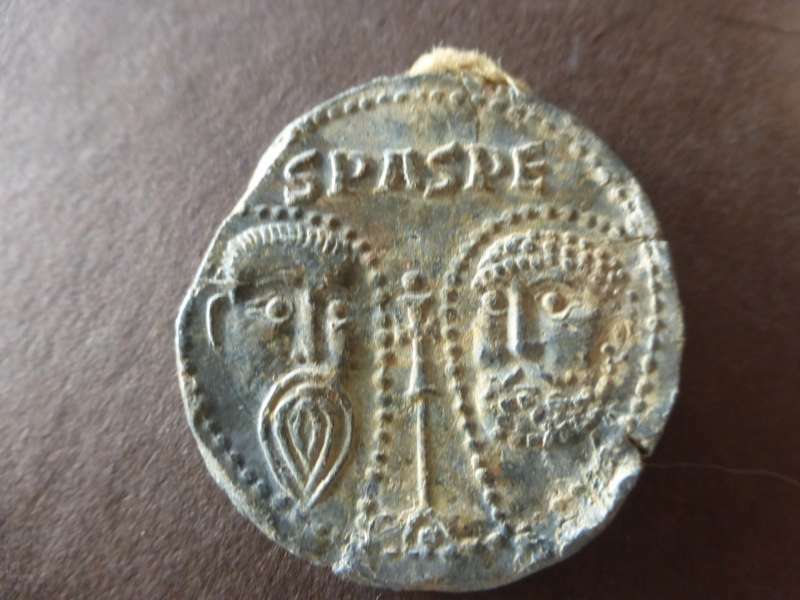 It is the lead seal that is appended to the end of a document acting as the signature of the pope. On one side, it contains the pope’s name and on the other, images of Saints Peter and Paul from whom he is given his authority. 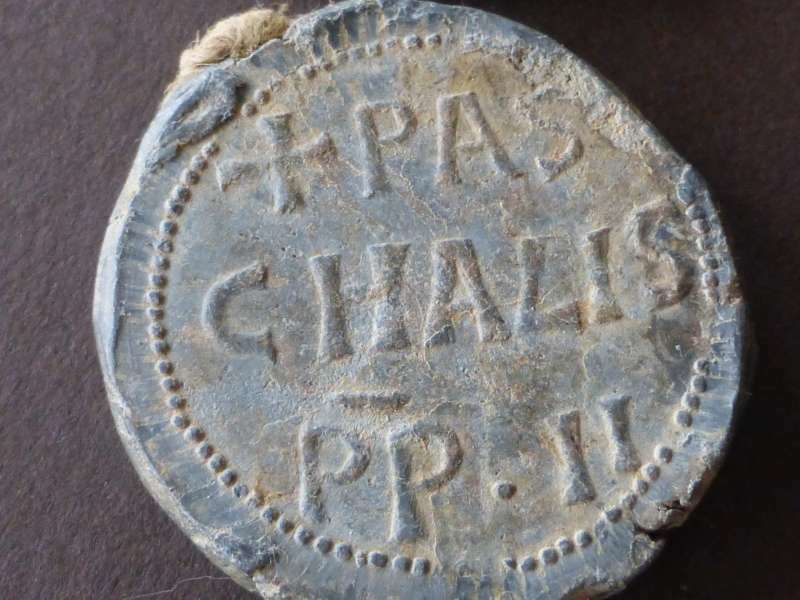 This bulla is extremely rare as it was used during the reign of Pope Paschal II who reigned from 1099-1118. It is one of the oldest artifacts in the Collection. 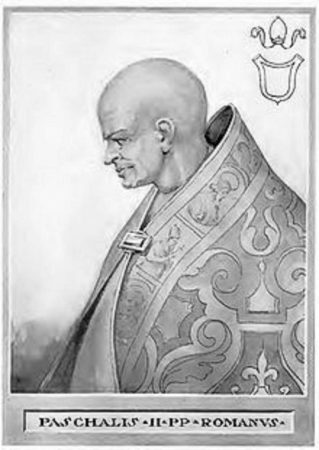 Upon the death of Pope Urban II (who was declared **Blessed** in 1881) the monk known as Rainerius was elected within two weeks. Born into an obscure family, about which nothing is known, Rainerius had entered the monastery at Cluny at a very young age, where he remained until sent by the monastery on business to Rome. While there, he caught the eye of Pope Gregory VII who made him the Abbot of San Lorenzo Outside the Walls. Around 1078, he was made Cardinal Priest of San Clemente. During his own reign, Pope Urban II sent him as his legate to Spain. He had clearly impressed those in high places. Rainerius took the name, Paschal II. Seldom in the papacy was a candidate so ill matched for the conflicts he faced during his eighteen year papacy. This dispute over the right of temporal monarchs to invest, that is, to decide who the candidates for spiritual offices would be, involved much more than a choice of candidates. It involved such things as clerical celibacy, simony, and misuse of power by candidates selected by royalty, rather than the Church itself. For the sake of reform, the Church had to take a stand on the investiture controversy. And, in fact, the Church had sought to do this at least since the reign of Pope Saint Gregory VII in 1073-1085. Such was the situation inherited by Paschal II. He made a serious error in judgment in backing Henry IV’s second son when he sought to depose his father and make himself the new Holy Roman Emperor. Although he promised allegiance to Paschal and an end to the investiture controversy, in truth, he was more brutal than his father and reneged on his promise, even going so far as to imprison Paschal along with seventeen cardinals when the Pope refused to crown him and grant him privileges related to the monarch’s ability to continue choosing priests and bishops. In the end, Paschal waffled in every direction, so that not only Henry V, but also the bishops and cardinals no longer trusted he could lead the Church with any believable authority. Clearly, Paschal had been honest with the Sacred College who elected him: monastic life had not equipped him to deal with the weighty problems confronting the papacy in such troubling times. And although he followed the lead of his predecessors he met with little success. Several times he was forced to flee Rome as one or another contingent sought to grab power, including no less than four anti-popes. Paschal received support from King Philip and the French people, but not from Germany from which Henry V, the Emperor, came. He was, however, successful in mediating a dispute between King Henry I (of England) and the archbishop of Canterbury, the pious Anselm. Through the work of a papal delegation and further mediation by Queen Matilda, a concordat was concluded between the king and the archbishop that prevented clergy from being invested by a monarch. In return, before their consecration, they first had to take an oath to the king. The feud between Archbishop Anselm and Henry I was of utmost importance since the King had exiled the archbishop and confiscated all the assets of the Church. In 1113, Pope Paschal officially recognized the Knights of Malta as a religious order through a papal bulla. The Order was founded in Jerusalem around 1050. It is still functioning today as one of the oldest Catholic Orders in the world. The Order’s mission is to protect the Catholic faith and to care for the sick and the poor. While they provide protection at various sporting events as part of their mission today, they can also be found in some of the most dangerous zones in the world aiding the poor. They celebrated their 900th anniversary in Rome in 2013. The first Crusade to recover Jerusalem from the Muslims occurred at the beginning of Paschal’s reign, but he was unable to repair relations with Eastern Christianity because of his insistence on the supremacy of the Bishop of Rome, and because he had also supported another Crusade that sought to usurp lands in the East not rightfully theirs. Paschal spent his final years squabbling with the Emperor and excommunicating anyone who supported him. 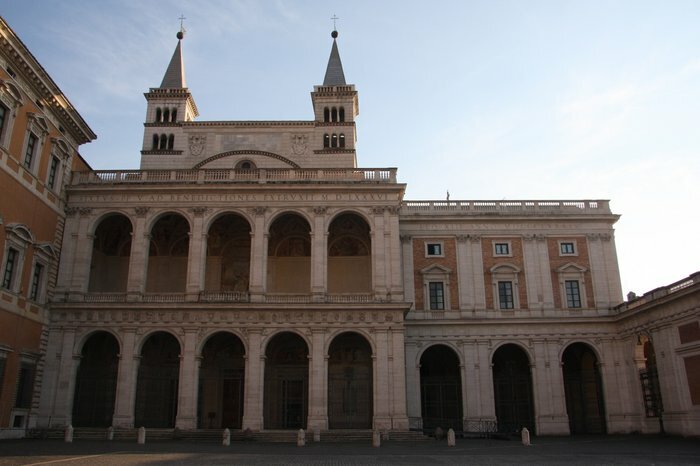 Despite his poor aptitude at diplomatic work in his papacy, he did repair buildings and restore various churches, one of them, right before his last flight from Rome due to bloody riots. Although he returned in January of 1118, he died at Castel Sant’ Angelo amidst new riots. He was buried in the Lateran after an unhappy reign as pontiff.